Kiwi chicks have hatched at Tawharanui, the oi, bellbird and kaka have returned to breed and pateke, tui, saddleback, whitehead and many other birds are thriving in this remarkable sanctuary. Why? In a nutshell, it's because of the absence of rats, stoats, cats and other introduced predators. The open sanctuary became effectively pest-free following the completion of a 2.5km "Xcluder" pest-proof fence and an extensive pest eradication program (including two helicopter bait drops) in 2004. Feral cats, possums, Norway and ship rats, weasels, stoats and ferrets were removed from the park and ongoing measures are aimed at the eradication of mice, rabbits and hedgehogs. Maintaining the pest-free status of the open sanctuary is the number one priority for TOSSI and the Auckland Council. While the 2.5 km pest-proof fence is impregnable there is still risk of incursion. Being an "open sanctuary" means that people are free to come and go and there is always the chance that they may (unknowingly) bring rats or other pests with them in camping gear or in their vehicles or boats. The fence is also open at each coast and, despite the elaborate koru-shaped fence-ends and the many traps set around these, rats and cats occasionally get around these barriers. TOSSI volunteers check the full length of the fence regularly for any damage or possible breeches. 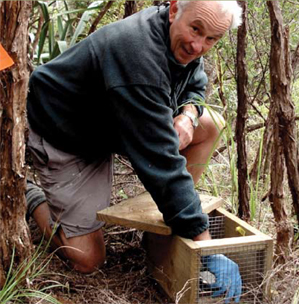 The Auckland Council has established a comprehensive network of trap and bait stations throughout the open sanctuary and in adjoining 'buffer' areas to control pest invasions. These are checked and re-baited regularly by Auckland Council staff and TOSSI volunteers. If rats or other pests are detected then a major response plan is activated with more frequent checks, increased trapping and other pest detection methods employed. Some rats and possums have been found inside the fence especially in late summer when food is scarce and the pests are roaming more widely. So far we have successfully controlled these outbreaks: a major achievement in itself.